Let’s talk about what are dentures? Dentures are removable devices which are used to replace missing or lost teeth. 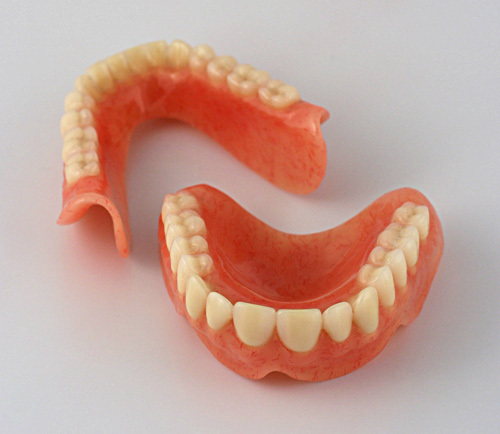 There are two types of dentures: complete and partial. Complete dentures are used when all the teeth are missing; and partial dentures are used when there are some remaining natural teeth. Complete dentures provide replacement for the whole set of teeth. They are again categorized in two types; conventional and immediate. In case of conventional dentures, 8-12 weeks are allowed for complete healing after the removal of teeth; while the immediate type is applied immediately after the removal of teeth. Partial dentures as the name implies, are used in the presence of some natural teeth. They are made by using a metal framework which is placed in a gum-coloured plastic base. The process of making the dentures involves several visits to the dental clinic and takes around 3-6 weeks to complete. The first step involves determining the appropriate type, and taking measurements as well as impressions of the jaw. It is followed by making models or wax forms; which are tried several times by the client. Once the dentist at a dental implant clinic is satisfied, final denture is created. Even after placement of dentures, a few adjustments are required. The major advantages of dentures include regaining of the ability to chew food, restoration of the facial contour and appearance and improvement in speaking proper words and phrases. What are the problems associated with dentures? Common problems associated with dentures include excessive saliva production for a couple of days, loss of taste and difficulty in chewing or talking in case of a loose-fitting denture.